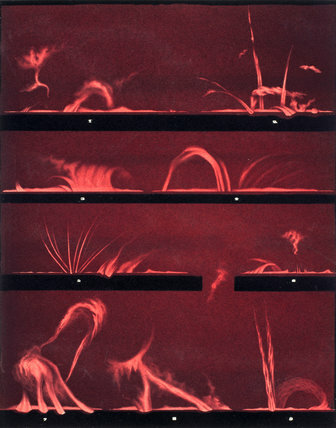 Lithographic colour print isued by Harvard College Observatory in 1876, showing nine sketches of solar prominences. Drawn in 1872 by Etienne Leopold Trouvelot (1827-1895), a French artist, these red protuberances on the Sun are normally only visible at totality during a solar eclipse. They can be seen at other times using a spectroscope that is aimed at a tangent to the Sun with its split-jaws partly open. Prominences are masive eruptions of hydrogen gas, often larger than the Earth, which arch away from the surface of the Sun. Asociated with its magnetic field, some violent flares called Coronal Mas Ejection can disrupt the Earth's radio communications and produce spectacular aurora displays. Four views of the Sun and Sunspots, 1872. Solar prominences, Plate 8, 1872. Solar prominences, Plate 9, 1872. Four views of Jupiter, plate 2, 1872. Four views of Sunspots, 1872.